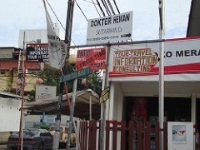 Most South East Asian capitals have a backpacker area, and Jakarta's Jalan Jaksa district is grubbier than most. Plopped in an unremarkable part of downtown, it is thick with travel agencies, laundromats, currency exchange offices and guesthouses. A few bars and live music venues cater to the travel crowd. The cheapest guesthouses are bare to say the least, and it is perhaps worth spending the extra money on renting a nicer room. Jalan Jaksa is a good place to stay if you want to spend as little as possible on accommodation in Jakarta, but don't expect to get much real local flavour. Jalan Jaksa is actually the name of a single street but a wider area around the road has started catering to budget travellers. The street was once frequented by students studying at the Jakarta Law Academy, which is perhaps the origin of the area's youthful vibe. It is friendly and cheap, good for those travellers who want to save their money for attractions and activities and don't mind simple sleeping arrangements. Jalan Jaksa hosts a street festival annually to encourage tourism and showcase local traditions, cuisine, dancing and music.